Get your kids ready for winter with an animal hat, scarf, and mittens from Cate & Levi. 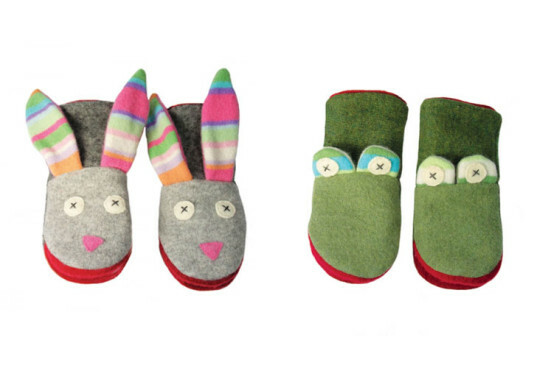 The adorable cold weather gear is made from reclaimed wool with soft eco fleece lining. Keep on reading to see all of the adorable animals your kid can choose from - if you let him make the call, chances are he'll be happy to wear them. Cate & Levi’s hats, scarves and mittens are all available in four styles: frog, bunny, dog and monkey. Each sweet design features fun touches such as floppy bunny ears on the mittens or a dog’s tail on one end of the scarf. If you’re familiar with the homegrown companies reclaimed wool stuffed animals, puppets, and other products, you’ll recognize the same mix and match styling. A variety of solid and patterned reclaimed wool and eco fleece is used to make the winter gear pop. If you like the exact colors and patterns you see here though, be forewarned, like all Cate & Levi creations the winter accessories are one of a kind. Each piece is handmade in the company’s studio in Toronto, Canada. The design team selects wool colors and textures that are similar to what you see here, but each item is unique. You can bet your child will be the only one wearing that dog hat and frog scarf on the playground! The winter accessories collection is sized for kids age two and up. Hats and scarves are one size fits all while mittens are offered in two sizes for 1-3 years olds and 3-10 years olds. Cate & Levi's hats, scarves and mittens are all available in four styles: frog, bunny, dog and monkey. 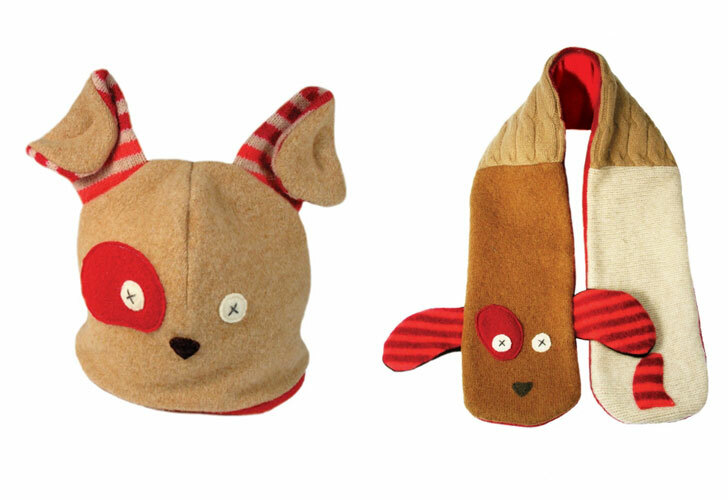 Each sweet design features fun touches such as floppy bunny ears on the mittens or a dog's tail on one end of the scarf. If you're familiar with the homegrown companies reclaimed wool stuffed animals, puppets, and other products, you'll recognize the same mix and match styling. A variety of solid and patterned reclaimed wool and eco fleece is used to make the winter gear pop. If you like the exact colors and patterns you see here though, be forewarned, like all Cate & Levi creations the winter accessories are one of a kind. Each piece is handmade in the company's studio in Toronto, Canada. The design team selects wool colors and textures that are similar to what you see here, but each item is unique. You can bet your child will be the only one wearing that dog hat and frog scarf on the playground!